Escrito el 28th Junio 2018. In July, TVCortos is Ziggo’s “Channel of the Month” in the Netherlands, meaning we are available to ALL Ziggo subscribers ALL month on channel 125! And to celebrate we are giving away a 40″ Samsung Ultra HD TV! To be eligible to win this great prize all you have to do is create an account on the new TVCortos app in the month of July. 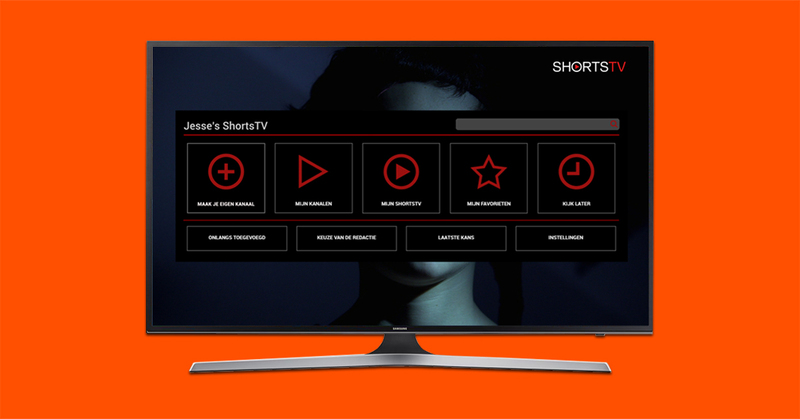 The TVCortos app allows you to create your own movie channels from thousands of the world’s best short movies and is only available to subscribers of the Movies & Series XL package on Ziggo in the Netherlands. But in the month of July it will be available to ALL Ziggo subscribers who have a Mediabox XL! If you are a Ziggo subscriber you can access the TVCortos app via the Ziggo app store on the Mediabox XL or directly from channel 125 by clicking the ‘back’ button on your remote control. Find out more about the app and how to access it here. The Prize Draw is only open to subscribers of Ziggo in the Netherlands who have Mediabox XL. The Prize Draw is run by Shorts International Limited (“SIL”). Our registered office is at 6-8 Luke Street, London, EC2A 4XY, UK and our company registration number is 03962510. For all queries or issues with the Prize Draw, please ring +44(0)207 613 5400 or email: info@shorts.tv. The Prize Draw runs from 1st July 2018 and closes on 31st July 2018 (inclusive) (the “Prize Draw Period”). By creating a user account on the TVCortos set top box app (the “App”) during the Prize Draw Period, you will be automatically entered into the Prize Draw. Only one entry per household. Prize Draw not open to employees or consultants of SIL or its associated companies. The prize is a Samsung Ultra HD TV (40″) with an estimated value of 699 Euros (the “Prize”). There will be one Prize awarded to the winner of the Prize Draw, selected at random by SIL and an independent observer after the end of the Prize Draw Period. The winner will be notified by email, in the week commencing 6th August 2018 and the prize will be delivered to the winner at the winner’s address in the Netherlands before the end of August 2018. If the winner fails to respond to claim his/her prize within fourteen days of receipt of the notification, or is unable to take delivery of the prize for whatever reason before the end of August 2018, SIL shall be entitled, at its discretion, to select an alternative winner. In such circumstances SIL shall use reasonable endeavours to notify the alternative winner within six weeks of the closing date. Prizes are non-transferable and there is no cash alternative. SIL reserves the right to substitute a prize of equal or greater value at any time. It is the winner’s responsibility to pay any and all applicable taxes on prizes in accordance with the laws of the Netherlands. SIL will not be liable if a prize does not reach a prize-winner for any reason outside the control of SIL or if a prize is damaged during delivery. SIL does not accept any responsibility for any damage, loss, injury or disappointment suffered by any entrant entering the Prize Draw or as a result of the winner accepting and receiving the Prize. The Prize Draw is governed by English law and any disputes or claims will be subject to the exclusive jurisdiction of the courts of England.